The multi-qubit chip has five superconducting transmon qubits and associated readout resonators. When cooled to absolute zero, such a device can compute things like quantum simulations of advanced materials. Credit: Quantum Nanoelectronics Laboratory, UC Berkeley. For more than 50 years, Moore's Law has reigned supreme. The observation that the number of transistors on a computer chip doubles roughly every two years has set the pace for our modern digital revolution—making smartphones, personal computers and current supercomputers possible. But Moore's Law is slowing. And even if it wasn't, some of the big problems that scientists need to tackle might be beyond the reach of conventional computers. For the past few years, researchers at the Lawrence Berkeley National Laboratory (Berkeley Lab) have been exploring a drastically different kind of computing architecture based on quantum mechanics to solve some of science's hardest problems. With Laboratory Directed Research and Development (LDRD) funding, they've developed quantum chemistry and optimization algorithms, as well as prototype superconducting quantum processors. Recently, they proved the viability of their work by using these algorithms on a quantum processor comprising two superconducting transmon quantum bits to successfully solve the chemical problem of calculating the complete energy spectrum of a hydrogen molecule. "Someday, universal quantum computers will be able to solve a wide range of problems, from molecular design to machine learning and cybersecurity, but we're a long way off from that. So, the question we are currently asking is whether there are specific problems that we can solve with more specialized quantum computers," says Irfan Siddiqi, Berkeley Lab Scientist and Founding Director of the Center for Quantum Coherent Science at UC Berkeley. According to Siddiqi, today's quantum coherent computing technologies do have the requisite coherence times, logical operation fidelities and circuit topologies to perform specialized computations for fundamental research in areas such as molecular and materials science, numerical optimization and high energy physics. In light of these advances, he notes that it is timely for DOE to explore how these technologies can be integrated into the high-performance computing community. On these new projects, the Berkeley Lab teams will work with collaborators in industry and academia to build on these advances and tackle difficult DOE-mission science problems such as calculating molecular system dynamics and quantum machine learning. "We are at the early stages of quantum computing, kind of like where we were with conventional computing in the 1940s. We have some of the hardware, now we need to develop a robust set of software, algorithms and tools to optimally utilize it to solve really hard science problems," says Bert de Jong, who leads the Computational Chemistry, Materials and Climate Group in Berkeley Lab's Computational Research Division (CRD). He will be heading a DOE Quantum Algorithms Team consisting of researchers from Berkeley Lab, Harvard, Argonne National Lab and UC Berkeley focused on "Quantum Algorithms, Mathematics and Compilation Tools for Chemical Sciences." 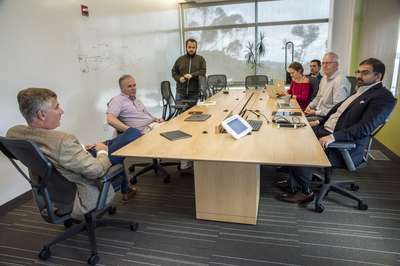 "Berkeley Lab's tradition of team science, as well as its proximity to UC Berkeley and Silicon Valley, makes it an ideal place to work on quantum computing end-to-end," says Jonathan Carter, Deputy Director of Berkeley Lab Computing Sciences. "We have physicists and chemists at the lab who are studying the fundamental science of quantum mechanics, engineers to design and fabricate quantum processors, as well as computer scientists and mathematicians to ensure that the hardware will be able to effectively compute DOE science." Carter, Siddiqi and Lawrence Livermore National Laboratory's Jonathan DuBois will lead DOE's Advanced Quantum-Enabled Simulation (AQuES) Testbed project. The key to building quantum computers that solve scientific problems beyond the reach of conventional computers is "quantum coherence." This phenomenon essentially allows quantum systems to store much more information per bit than in traditional computers. So whereas a conventional computer bit encodes information as either 0 or 1, a qubit can be 0, 1 or a superposition of states (both 0 and 1 at the same time). A qubit's ability to exist in multiple states means that it can, for example, enable the calculation of material and chemical properties significantly faster than traditional computers. And if these qubits could be linked or entangled in a quantum computer, problems that cannot be solved today with conventional computers could be tackled. "Quantum computing is like playing a game of chess where the pieces and board are made of ice. As the players shuffle around the pieces, the components are melting, and the more moves you make, the faster the game will melt," says Carter. "Qubits lose coherence in a really short amount of time, so it's up to us to figure out the most useful set of moves we can make." "Computational approaches are common across most scientific projects at Berkeley Lab. As Moore's Law is slowing down, novel computing architectures, system, and techniques have become a priority initiative at Berkeley Lab, " says Horst Simon, Berkeley Lab's Deputy Director. "We recognized early how quantum simulation could provide an effective approach to some of the most challenging computational problems in science, and I am pleased to see recognition of our LDRD initiative through this first direct funding. Quantum information science will become an increasingly important element of our research enterprise across many disciplines." 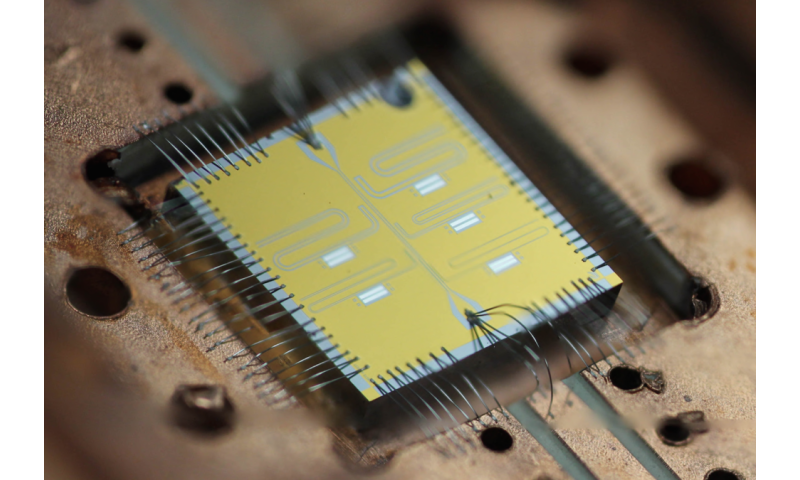 To design and fabricate the next generation of quantum processors, the AQuES team will leverage the superconducting circuit facility in UC Berkeley's Quantum Nanoelectronics Laboratory while incorporating the expertise of researchers in Berkeley Lab's Accelerator Technology and Applied Physics, Materials Science and Engineering divisions. The research teams will also use the unique capabilities of two DOE facilities; the Molecular Foundry and National Energy Research Scientific Computing Center (NERSC), both located at Berkeley Lab. This will be the next/ongoing major breakthrough. Once they reach 50 quebits the quantum computer will have quontum supremacy. Once that happens it will change everything. With the help of quantum computer simulations, fusion will quickly follow along with a revolution in new materials and drugs, just to name a few. The first halting steps toward a real universal quantum processor. I remember when the 8080 hit the street.